On May 30 President Trump tweeted that Russia is “laughing at the U.S.” If so, it is because the ordinary social and economic agenda of the US government is being sidetracked by the Russiagate investigation, causing the kind of divisiveness and dysfunction that Vladimir Putin presumably wants. But with the fate of the Trump presidency now clearly imperiled, Putin may not be laughing at all: His favorite American family may have a limited future. “There was a cancer growing on the presidency,” John Dean put it to Richard Nixon. Today, that cancer is back, and it now threatens Trump’s son-in-law. Jared Kushner is front and center in the FBI’s investigation, reports say. He had a number of exchanges with Russian officials prior to January 20, among them the infamous effort, with General Michael Flynn alongside, to set up a secret back channel to Moscow within the Russian embassy in Washington. Kushner also had contact with the head of the state-owned Vnesheconombank (VEB), whose job seems to include projecting Russian influence. It has ties to Wall Street investors and New York banks; it also has had convicted spies among its employees (www.nytimes.com/2017/06/04/business/vnesheconombank-veb-bank-russia-trump-kushner.html). The Obama administration sanctioned VEB last year, and the banker with whom Kushner spoke has close ties to Putin and a past history with Russian intelligence. The question with Kushner is the purpose of these contacts. Was he simply wanting to set up a direct communication line to Putin? Was he wanting to open discussion about US-Russia cooperation in Syria? When he talked with the Russian banker, was he wearing his real estate business suit (the bank’s explanation) or simply offering diplomatic niceties (the White House version)? Here’s a different explanation: Kushner’s purpose, supported by Donald Trump, was to begin redrawing US policy on Russia with the aim of easing sanctions in exchange for certain Russian “services.” The back channel to Putin was no innocent “let’s get together” effort; it amounted to “play for pay.” Removing sanctions on Russia, including those on VEB, would help promote the Trump brand there, a longtime Trump ambition. Talking with Vnesheconombank would facilitate Russian financing of Trump and Kushner business ventures in the US and elsewhere at a time when VEB is in serious financial straits. While none these contacts were illegal, they created Russian leverage on the Trump administration. 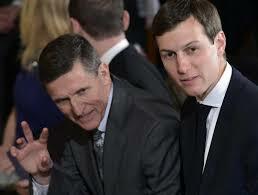 Neither Kushner, Flynn, or anyone else in the Trump transition team should have contacted Russians with known intelligence connections and the capacity to put them in a compromising situation. We already know that Flynn’s contact with the Russia ambassador specifically promised a softening of US sanctions on Russia. We also know that soon after taking office, so far unnamed Trump associates—very possibly including Kushner—tried to persuade State Department officials to lift sanctions. But the State officials pushed back, and alerted members of Congress who then sought to insulate the sanctions from Trump pressure (http://thehill.com/policy/national-security/336032-trump-officials-pressed-state-dept-staffers-for-plans-to-lift-russia#bottom-story-socials). There was nothing accidental about these secret contacts. Trump surely knew what he was doing: His long delay in firing Flynn, his defense of Flynn since then, and deployment of his son-in-law, suggest as much—all the more so in the case of Flynn, who may have damaging information about his former boss that Trump finds worrisome. Trump’s exchanges of laudatory comments with Putin; his refusal to believe US intelligence conclusions about Russian meddling in the 2016 election; his undermining of US ties with NATO and the European Union; his longstanding efforts to promote Trump’s business interests in Russia; and Trump’s money problems—all these provide a foundation for explaining Kushner’s and Flynn’s mission, which was to curry favor with Putin’s circle by dangling the carrot of ending sanctions. Some former US intelligence officials have gone beyond calling these contacts stupid or naïve. They are compromising, and border on treachery. They feed directly into the investigations of the Trump team’s collusion with Russia during the 2016 campaign. And they move Jared Kushner to center stage as Trump’s key operative. BINGO! Your assessment of Kushner’s role is likely on the mark. Clarity of what you write makes for easier understanding and the variables. Thanks for your wisdom. Why wouldn’t contacts with the VEB for purposes of pushing Trump’s financial interests be illegal, especially by Kushner himself who is subject to conflict of interest restrictions, isn’t he? And how do you conclude that Flynn might have damaging information about Trump?